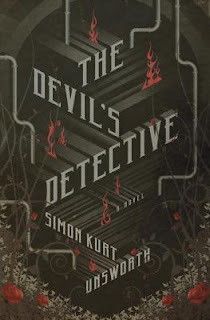 Imagine being a detective in hell – a place where demons rule man and use him for sport. That’s the task facing the reader in THE DEVIL'S DETECTIVE. In this novel, Thomas Fool is the leader of hell’s small human police force, an Information Man. He has no memory of his life before hell and no knowledge of how or why he came to be there. His job is a cosmic joke; in a place where chaos reigns and humans are a subjugated by demons, he is expected to keep a semblance of law and order, while humans die all around him. I’ve made the novel sound bleak so far, but this is a book worth reading as it asks big questions like does having a purpose in life matter if life is futile? Does truth matter in a setting where evil literally reigns? The plot involves a delegation of angels visiting hell to decide who can ascend to heaven. During the visit, demons begin to turn up dead. Are humans rising up or is something more sinister going on? Thomas Fool is tasked by Elderflower, his demon supervisor, to find the truth. As a character, Fool does not live up to his name. While going about his duties, he attempts to investigate his own existence, never sure of who he is or what he is but always looking for why. As he begins to see the truth of why hell exists and his function in this place, he begins to feel a very human emotion – hope. The setting of this story is unique and while in some ways the detective element is utilized as part of a morality tale about guilt and how the guilty should be punished, this is also a crime novel that makes the reader think. However, given how unremitting the setting becomes – you never escape the fact that hell is a terrible place that makes sense only on a cosmic level – this novel had me pondering how the human condition shapes who we are and how we respond to evil. Overall, I’d recommend this book, but don’t expect a very happy ending.